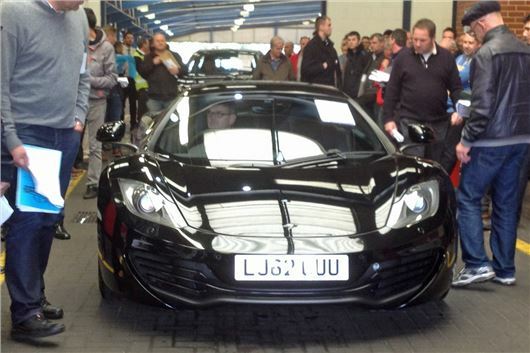 A year old McLaren MP4-12C sold For £127,000 at Auction today. A six-month old Jaguar F-Type V8-S also sold, for £62,400. The McLaren was a September 2012 example in Carbon Black with Stealth Pack and 6,724 miles. The tyres looked fairly chewed up from track work and the rears needed replacing (at £283.10 a side for P Zero Nero 305/30 R20s). We found 39 McLaren MP4-12Cs advertised online at prices from £126,990 for a 2011 MP4-12C coupe to £214,400 for a 2013 MP4-12C Spider. The Jaguar F-Type was a May 2013 with 2,637 miles, standard apart from an audio upgrade. It sold for £62,400, which is £17,585 behind its list price of £79,985. A full report of the day's sales, including four cars sold for £150 each, will appear on Saturday 26th October.